Updated Wednesday March 13, 2019 by Brookwood Athletic Association Baseball & Softball. A maximum of twelve (12) players can play defense with a maximum of seven (7) on the dirt prior to the ball being hit. A. There will be a clearly visible mark halfway between the bases. B. There will be a 16 foot diameter pitcher’s circle drawn on the infield. The center of the circle will be a point 36 feet from home plate on a direct line between home plate and second base. This point is measured from the back tip of the plate. C. The pitching rubber or a pitching mark will be placed 30 feet from home plate on a direct line between home plate and second base for the purpose of kid pitch. 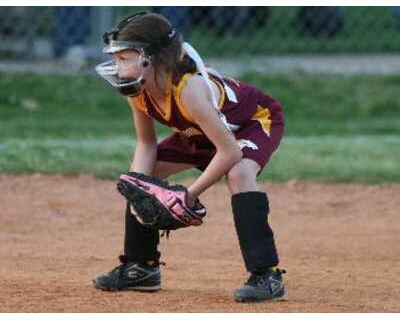 The pitcher must wear a facemask and heart (chest) guard. Each batter will receive a total of five (5) pitches or three (3) strikes (constituted by a swing and a miss or a foul ball except on the third strike) from her adult coach. A batter will not be called out on strikes as long as she is fouling the ball. If the ball is hit, the coach who is pitching must immediately exit the playing field so as not to interfere with the defense and the umpire’s line of sight. If the batted ball hits the pitching coach, the ball is called dead, and the batter must bat again. The pitch does not count against the pitch count if the batted ball strikes the coach pitcher. If a base runner is past the halfway mark between the bases when time is called, the base runner is awarded the next base. If the base runner is not halfway, she must return to the last touched base. Base runners will be allowed to get all they can on overthrows to any base. There are no walks in this age division. The defensive player pitcher may stand anywhere within or directly behind the sixteen (16) foot pitching circle. Directly behind is defined as if there were two parallel lines running from the outside of the pitching circle and continuing toward the outfield. The player pitcher can stand anywhere between these two imaginary lines behind the pitching circle but may not be any deeper than the edge of the outfield grass. She is the only player allowed in the circle prior to the ball being pitched. No more than seven (7) defensive players will be allowed on the infield (including the catcher) prior to the ball being hit. No defensive player on the infield may stand closer to the batter than the player pitcher. When the ball is in play, the umpire will call time when either a) the player pitcher has full control of the ball and is inside the pitcher’s circle with both feet; or, b) when, in the judgment of the umpire, all runners have stopped advancing. If the player pitcher is attempting to make a play and runs through the circle, the umpire will not call time. Any time players remain in jeopardy of being put out; umpires have the option of not calling time. If a player hits a fly ball to the player/pitcher and she catches it, it will be the umpire’s judgment to call time. If the batter hits a ground ball, which is fielded by the player pitcher inside the circle, and she makes no attempt to make a play at first, the batter will advance to first base. No other runners may advance unless forced. One (1) defensive coach is allowed outside the dugout within arm’s length of the dugout area. No coaches may be in the outfield during defensive play. Defensive players may not intentionally ground or roll the ball. The ball must be thrown overhand during live play. The umpire will not honor outs made by intentionally grounding or rolling the ball. Umpires judgment. Catchers are required to wear a catcher’s helmet with approved mask (or approved batting helmet) and a chest protector. Shin guards are optional. Pitcher players must wear a face mask and heart (chest) protection. When playing out of park, or playing teams from another park, player pitch will take place in the first (1st) inning. When playing in park games (Brookwood vs Brookwood), player pitch will take place in the third (3rd) inning. During the player pitch inning, each batter will be allowed any number of pitches until she either has three (3) strikes against her (and will be scored a strike out) or four (4) balls. After four balls (not four pitches) are thrown by the player-pitcher, the coach-pitcher, who should be ready to take the field and pitch, will take over pitching with the current strike count from the player pitcher. There will be no more than two pitches from the coach pitcher and the batter must hit one of those two pitches, or she will be called out. Example: If the coach takes over the pitching with two called strike from the player pitcher, a missed swing, even on the first pitch, will count as the third strike and the batter will be called out. Endless Foul Balls will be in effect; therefore, the batter will continue to bat with a coach pitcher as long as she fouls off the third strike. A batter hit by a pitch during player pitch innings will be given first base if in the judgment of the umpire the player either made an effort to avoid the pitch or was unable to avoid the pitch. Example: On a rolling ball that hits the batter and in the judgment of the umpire the player made no attempt to avoid being hit by the pitch, the batter will not be awarded first base.